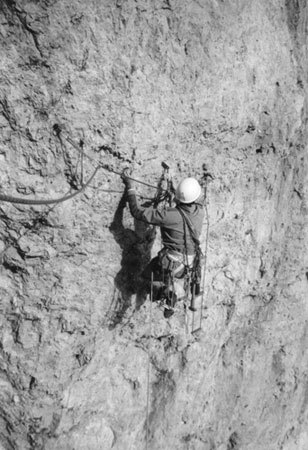 Marco Bianchi climbing on Grignetta. Happiness, amazement, attraction, freedom, but also doubts and fears. This has always been to me the world of the mountains. Not a physical place where to practise a sport, not a conquest land or a competition field, but a natural and unique and marvellous habitat where I could move looking for the unknown, where I could feel the excitement of the discovery, where I could find the harmony that our civilised society tries more and more to undermine, and also the magical place where I could feel, even though for only one moment, the illusion of the fairy tale. I never considered the reaching of the top as a victory or a conquest. Like a self-affirmation or an individual achievement. It is the attainment of an intimate sense of peace, of calm. The only moment when the fire raging in my soul is gone, and for a few instants I feel I belong to the Universe. When I am myself the cold, the snow, the wind, the sun. 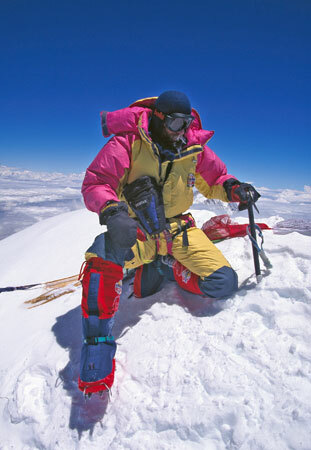 Marco Bianchi on the top of Everest. Although I was born and raised in a big city, I was lucky enough to get to know the mountains and to go there very often since I was a child during the summer holidays. While walking on the trails of Val di Fassa and Val Gardena, at the bottom of the Sella Group or of the Sassolungo, I felt fascinated by the woods, the gravel slopes, the sharp ridges and the yellow vertical walls. I felt an irresistible curiosity that kept pushing me ahead to discover what was round the next rocky ridge or beyond the most distant range. I was an avid reader of all the books on climbing that I could seize, and I dreamed of wonderful adventures in the most remote corners of the Earth. In my mind the big mountains of the Alps, from Mont Blanc to the Matterhorn, not to mention the Himalaya with his gigantic Eight Thousands, looked as if they belonged to another planet. I was unable to think of what their size could be, since it was a superior, unreal world, which floated in my imagination, intangible and impossible to reach. Also the photographs stroke me immensely. The North Face of the Grandes Jorasses with its dark pillars or the North Face of the Eiger with its slopes of corroded limestone frightened me as much as the tales of their ascents. However the instinct pushed me towards the mountains and now I know that it was the curiosity of discovering, together with the dreams generated by the books and the photographs, that made me climb in the Alps and in the rest of the world. As an adult I had the luck and the privilege to make my dreams come true. My encounter with the Himalaya, with this long-dreamed-of reality, has matched and then surpassed all the expectations I had for this almost supernatural world, revealing to me a dimension even more magnificent than the one I could imagine. On Everest and K2, on Dhaulagiri and Manaslu and on the other Eight Thousands, I knew for certain that my love for the mountains was determined by curiosity, which in turn was always surpassed by the beauty of what was around me.